Low Radiation Dose Computed Tomography (CT) uses low levels of radiation to help diagnose and monitor a wide array of conditions. A CT scanner has detectors which move around the body in a circular motion. This allows detailed images to be built up as you move through the scanner. The CT scans are cross-sectional views of the body that can be viewed in a sequence, much like slices of bread stacked together. Using the CT scanner and a powerful computer, we can build three dimensional images showing the soft tissues, bones and blood vessels, and see parts of the body, which are difficult to view by any other method. 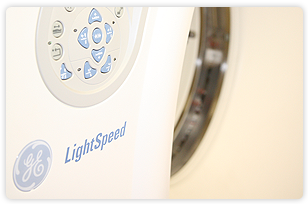 Most CT examinations are simple, fast and painless. There is often no preparation required for a CT scan. However, depending on the area of the body being examined you may be asked to fast for a period of time before your scan. For some examinations of the abdomen, you may be given some water or a special drink before your scan. You will be advised by our reception staff if you require any special preparation when you make your appointment. Once you arrive at the clinic, you will be given a questionnaire to complete, which asks you to provide information about medications you may be taking, known allergies and medical conditions you have. Please inform us if you are taking any diabetic medication, have kidney disease or have had a previous reaction to x-ray contrast. Please bring a list of all your current medications to your appointment. You will be asked to lie on a table which is moved into the centre of the scanner. This contains the x-ray tube and sensitive detectors. These rotate around the part of the body to be examined but will not touch you. You may be asked to hold your breath for a few seconds during the scan. You will be monitored by our trained staff at all times. Some CT examinations require an injection of a special contrast, which contains iodine, to enhance a particular body part or structure. Without this injection some important abnormalities may go undetected. The contrast or dye is usually injected into a vein in your arm. For CT arthrogram studies, it is injected into the joint that is being scanned. If you need an injection of contrast you will be asked to sign a consent form before your examination. Side effects from having a CT scan are very rare. During your procedure you will be exposed to a small amount of radiation. The benefits of detecting disease are believed to outweigh any potential risks from receiving such a small dose. 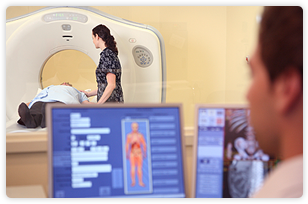 At Perth Radiological Clinic, we have low radiation dose CT scanners and special protocols to ensure that radiation during the scan is kept to the absolute minimum required to produce diagnostic quality images. If you need to have an injection of contrast dye it is quite common to experience a warm flush and/or a metallic taste in your mouth. Occasionally some patients may experience transient nausea or an itchy rash. These side effects, if they occur, do not last very long. Other more severe allergic reactions are extremely rare. Please inform the technologist if you think you might be pregnant before your scan. Your CT scan will be analysed and reported by a fully qualified and accredited specialist radiologist (a medical doctor with specialist training in diagnostic medical imaging). The CT scanner generates a large number of images, which need to be carefully analysed by the radiologist. The processing, reviewing and reporting of your CT images may take up to 1 or 2 hours. Additional time is required for typing the report, printing films and creating a CD of your images. Usually, the report is available to your referring doctor the next working day. Please notify the reception staff if you are going to wait for your films.